Manuel Rafael Gallegos Lerma was born in Chihuahua, Mexico. He learned English as a high school exchange student in Germany. Lerma is currently working on a PhD in Sociology at the University of North Carolina at Chapel Hill and is the Associate Director of the Human Rights Center of Chapel Hill and Carrboro. The interview begins with a brief discussion on Lerma's personal background and how he met his future wife while studying in Germany. Lerma mostly talks about his research interests and the work he does with the Human Rights Center. Elise Stephenson: This is Elise Stephenson and today I am interviewing Rafael Gallegos. It is March 29, 2011. How are you Rafael? Rafael Gallegos: I'm good Elise. ES: First off, tell me a little bit about yourself. Where are you from? have three more siblings. I am the oldest of all. Anything else? ES: Is your family in Mexico or are they here in the states? RG: Yea, my parents are in Mexico. Only one sibling is here in North Carolina with me. years after that. But everyone else is back home. ES: And how did you make it here to NC? What was that process? citizen. So she has dual citizenship as far as I know. ES: And did you receive US citizenship through marriage? RG: Well, I haven't applied for citizenship. I just have residency. and then later here at NC State and UNC? RG: And then I applied to UNC and I am currently doing a PhD in Sociology. ES: And what are you studying for your PhD? ES: What research are you doing in sociology? What particular part of sociology? thesis that I submitted for the masters was a study, a qualitative study of day laborers in Carrboro. ES: And was this more participatory, observational-participatory research? it was an interesting study practice for me. ES: Do you hope to continue with research in that area? ES: You used the term corner. Could you clarify that? difficult. But it does happen often. collaborative "we are in this together"? everyone who is there can do their job. If they don't, then employers won't go there anymore. direction. So I argue that it is much more collegial than other places. the members of Abbey Court? depends on at what stage of the immigration process you are. some people so much more successful than others? the US improved their situation economically? relatives in Mexico so they can put it in the bank. They are able to go back and have a better life. them to do better. They adapt very well. I mean many of them at least. They are very adaptable. Maybe less than ( ). ES: What motivated you to study day laborers on the corner? in doing that kind of work. So that is what brought me to Chapel Hill. ES: And how did you first get involved with the Human Rights Center? could certainly engage in as part of a reciprocity toward the people I was intending to research. think that was very positive. So that is what drove me to work with her. management at Abbey Court. So I think it has been a very enriching experience for me. ES: What do you find to be the greatest strengths about the program? ES: The Human Rights Center. amazing what happens there. That's why I think. ES: Why do you think people are so motivated and willing to give their time? RG: As far as students go, this is efficient in the sense that they get their service learning. and you notice that the person you are working within two weeks has improved tremendously. other ones. And just the families in general, not just the kids. ES: Alternatively, what do you see as weaknesses? us as a stable and promising non-profit. In the meantime, it's going to be very hard. I think we do have enough students that go there that we are able to deal with that. can. I don't have a rubric, if you will, or a job description. It would be really hard. exactly what you are in Abbey Court? concerns, and sometimes you have to make judgment calls. So that's what happens. ES: What's your opinion on community participation in Abbey Court? RG: I think that would be great. You know, it's something that we've been trying to do. that they might not be there for a long time, so therefore they just aren't going to get involved. How do you attract those people is complicated, so that is something we are still working on. ES: Do you feel that it is often the same people who are involved? ES: What have you done to advertise or promote the services and programs at the HRC? of funding so it's hard to have an event and you just pay for it. That would be really, really hard. then it becomes really hard. That is one of the difficulties. RG: What do you mean by face? increase participation, trying to help undocumented—often undocumented—Latino immigrants? are willing to try things. I think that's what we are trying to focus on. ES: Kids as the future? ES: Do you believe that families are very invested in their children in Abbey Court? undocumented and yet only know the United States as their home? hard to tell. It's something they know very well not to talk about because of the consequences. ES: That's another obstacle you run into. your goals for the future of the center? people. So yeah, expansion I guess. ES: What about your personal goals? would be something that is part of what we are trying to accomplish. through your work at UNC and just since, I guess you said, you were a boy in Mexico? RG: My understanding of labor in the US? is the strongest impetus for migration: labor demand. undermined the hardships of people in the US. ES: Of immigrants in the US? shocking, and it is something I did not expect. ES: So you think more change is needed in the United States or in Mexico? really bad patching up of the laws. It needs to be thoroughly revised, to be more human I guess. citizens can be doing in their daily lives to help improve the situation for immigrants? do through the kids. Maybe that would be a goal for the future. RG: I think it was a really good interview. 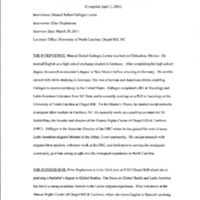 Interview with Manuel Rafael Gallegos Lerma by Elise Stephenson, 29 March 2011, R-0469, in the Southern Oral History Program Collection #4007, Southern Historical Collection, Wilson Library, University of North Carolina at Chapel Hill.